ICB's Project GEM, Girls Education Matters, works to improve girls' education in developing countries through awareness building and fundraising efforts, in support of specific initiatives managed by Oxfam America. Since its inception in 2010, Project GEM, in partnership with Oxfam, has worked to renovate, build, and enhance the effectiveness of girls’ schools in Pakistan and Somalia. Project elements have also included teachers’ training, health programs and building of self-advocacy capabilities such that schools can continue in a sustainable manner once the initial project has completed. 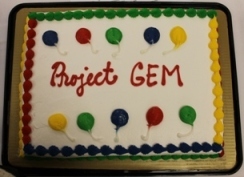 In Pakistan, Project GEM has supported 45 girls’ schools, including substantial physical renovations at 7 schools, benefiting over 9000 students. In Somalia, Project GEM has built a girls’ education center from scratch, which provides primary education to girls during the day and skills training to women in the evening, benefiting over 200 girls and women. In addition to the generosity of our adult supporters, student of ICB Sunday School have raised funds to build playgrounds at each of the 7 schools in Pakistan where Project GEM has supported major physical renovations. Online donation to support ICB projects can be made via the Paypal link on the left.